The spacious living room opens onto the expansive pool patio, overlooking the third fairway of the Sandy Lane Golf Course with panoramic views of the Caribbean Sea beyond. Dining can be casual in the pool gazebo or more formal in the tasteful dining room which opens onto the pool deck. There is a choice of four double bedrooms. 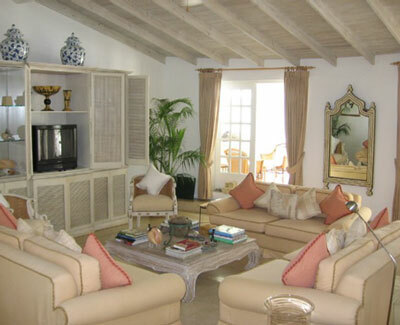 Three bedrooms overlook the pool, with one bedroom in the main house, all have ensuite bathrooms and air-conditioning. The master suite is not available for rental.